Every woodworker knows that wood expands and contracts and we build to accommodate that. We use joinery that allows panels and boards to grow or shrink across the grain as they react to changes in humidity. Moisture can also affect our work in other ways. 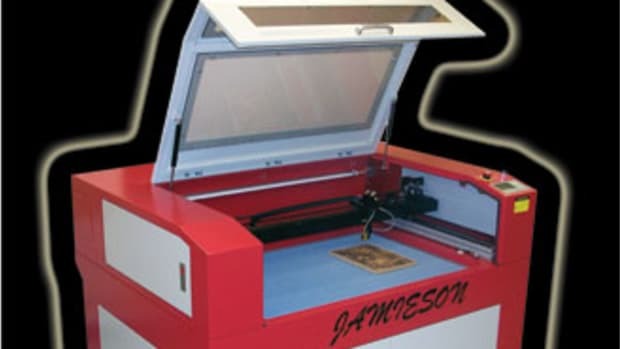 For example, it can delaminate plywood by causing veneers or adhesives to fail. Water can be detrimental to finishes, too. 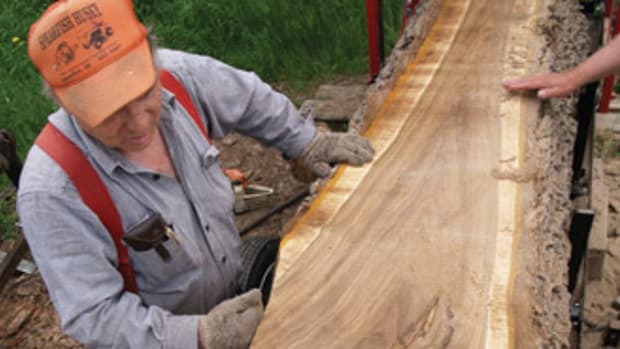 The Lignomat USA website (www.lignomatusa.com) lists a number of common moisture problems that woodworkers can see after water has done its ugly work and suggests that we might be more rigorous up front in testing materials during the construction phase. 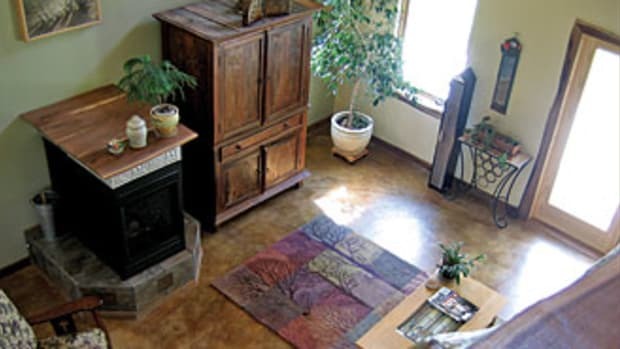 These adverse effects include chairs with loose joints, a cabinet door that will not close, a butcher-block table with a crack down the middle, a veneered surface with checks, edgebanding applications where the glue line fails, a jewelry box with crooked joints, cupped floors and foggy finishes. 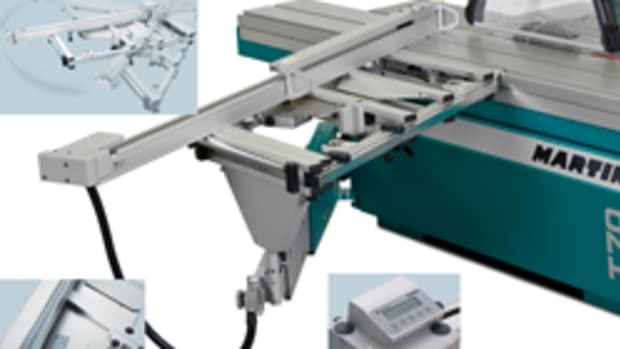 The biggest problem for woodshops in terms of moisture is movement. There are a lot of side issues related to that. 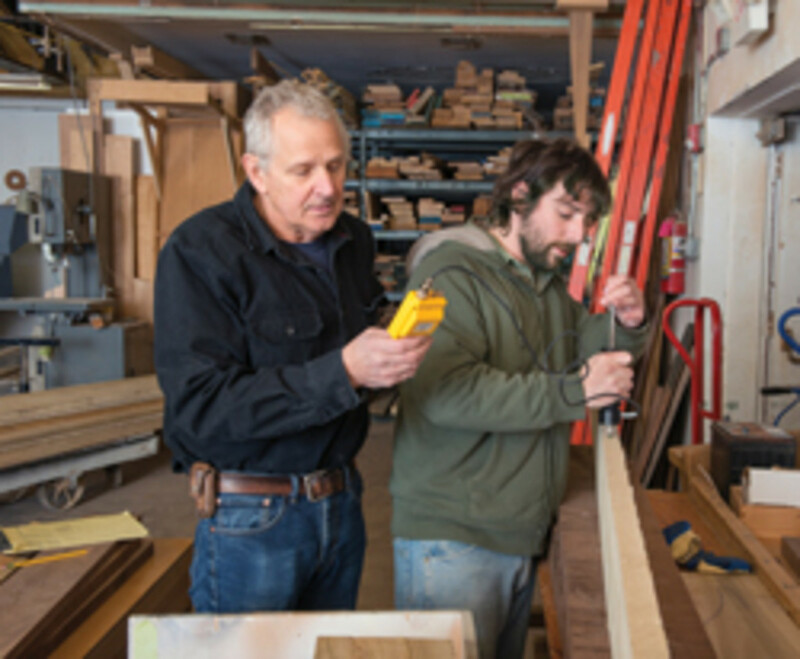 The geographic location of both the woodshop and the customer are important. A piece of furniture built in the Las Vegas desert will obviously behave differently than the same work done in Seattle. A cabinet that’s installed beside the swimming pool in a hotel might have special issues as might one aboard a ship or in a sauna. The thickness and width of a board will also help determine how it moves, as will the cut. Fibers near the surface of a board react more quickly to changes in humidity than those at the center, so thin boards are generally more susceptible to short-term changes, while thick boards will react more over time. In most cases, quartersawn or rift-cut boards will be more stable and less lively than plain-sawn ones. Just to confuse the issue even more, there are two types of moisture in wood. Bound water resides in the cell walls and free water stays in the larger, hollow centers of the cells (called lumens). Softwood mills usually run boards through a kiln for a few days at high temperature to reduce the moisture content to about 20 percent. They are removing mostly free water. Hardwood mills will run a kiln for perhaps four to six weeks at very precise temperatures to reduce the composite reading (all water) to somewhere in the region of 6 to 12 percent. The first step in dealing with moisture is to measure it. By knowing the moisture content of a board, we can determine with some accuracy how much a species will react. Moisture content is always expressed as a percentage. Today, most meters deliver the reading on a digital LED display, but there are still some analog (needle) ones available. 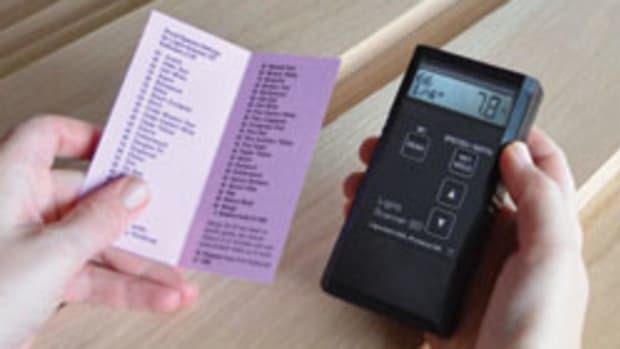 Moisture meters are used in several industries, so check whether the meter you’re looking at has a choice for various materials such as wood, hardwood or softwood. Today’s meters typically have two scales. The first, for air- or kiln-dried wood, will cover the lower range (usually up to either 12, 15 or 17 percent) and the other will be appropriate for green wood. Many meters use traffic signal colors (green, amber/yellow and red) to indicate ranges of moisture, the green being the driest (which is a little counterintuitive). A wood moisture meter will be designed to take readings with pins or without them. Some meters offer both options. Pins look like a pair of sharp, but sturdy medical needles and many meters come with a few pairs that have differing lengths. Sometimes the shafts of the pins are insulated almost all the way to the tip and this is designed to deliver a more accurate reading at the tip. In general, the farther you can drive the pins into a board, the better the reading. That’s because the wood closest to the outside will usually be drier — and occasionally wetter — than the cells near the center of a thick board. The epidermal (outside) cells react more quickly to changes in the humidity of the air. The meter takes a reading between the tips of the pins, so generally the deeper they are, the better. Some species are just too dense for long pins to penetrate. The reading is actually a measurement of electrical resistance. Dry wood won’t carry a current and, the wetter it gets, the better it will conduct. One big problem with pin meters is that they leave holes. In red oak or other coarse-grained species, that isn’t such a big problem. But they can really show up in tight, fine-grained species and can be a real pain when it comes to costly veneers. Another disadvantage is that the pins usually don’t penetrate very deep into a board. The max is about 5/16” or maybe 3/8”. If you’re working with anything thicker than 5/4 stock, that can be a problem. They don’t read the moisture in the middle of the board. There are usually kits available that provide very long and insulated pins and these often require that the woodworker actually drill holes in the stock most of the way in and then push the pins in the last little bit. The insulation limits false readings, but can also make the pins thicker and thus the holes need to be larger. Some manufacturers offer hammer probes for deep readings: These are driven into the wood and then connected to the meter. Some woodworkers slide one pin on either side of the board if they are set far enough apart and take a surface reading without actually driving the tips into the wood. However, the accuracy of this approach is questionable. One way to combat the depth limits of pins is to assign one board from a batch for testing, crosscut a few inches off one end and immediately take a reading in the newly open end-grain. Don’t wait for more than a few seconds as the moisture in the freshly cut cells will begin to equilibrate (try to become the same as the ambient air humidity). Also called non-invasive or non-destructive, a pinless meter uses radio frequencies to measure moisture without actually penetrating the board. Many of these meters come with small apps or printed handbooks that let the user choose a specific species or group of species to gain more accurate results. These work by introducing the specific gravity (density) of various wood species into the equation. Moisture moves more slowly and accumulates less in more dense fibers. Some manufacturers offer pinless meters with holes where you can screw in pins and thereby have both types available for different tasks. Better meters, pin or pinless, have a “hold” feature that keeps the reading visible even if you have to change hands to get the meter out of a tricky woodpile. Most meters will also let you measure dampness in wood siding, failing floors, plasterboard and other materials — some even measure moisture in bales of hay. When shopping for a meter, keep a couple of things in mind. If you’re running a kiln, you’ll want a remote reading meter that can report progress inside the dryer without having to open the door. Compare warranties among the meters: they tend to live rough lives and get dropped and beaten up quite a bit. Do an online search for reviews by other woodworkers and pay special attention to any comments about customer support. Sources include Lignomat, Wagner, Delmhorst, General Tool & Instrument, GE Protimeter, Extech, Sonin, Mudder, Amprobe and Tramex. 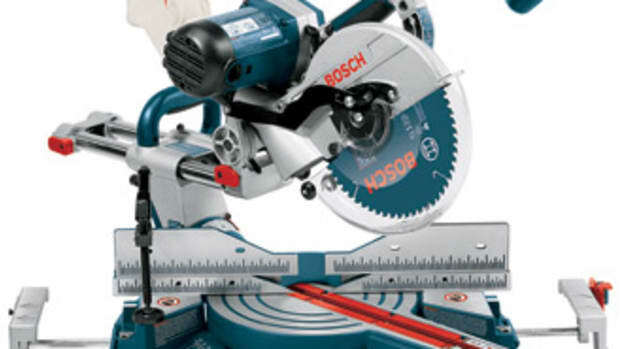 Most of these brands are widely available in big-box stores and through online woodworking catalogs. In addition, Stihl sells a moisture meter in Europe that is marketed for testing firewood and it can be ordered in the U.S. through eBay and similar sites. For information about moisture meter companies, visit our online resource guide at www.woodshopnews.com.